S & D Models pewter detailing kit for the Bachmann old time coach or combine. 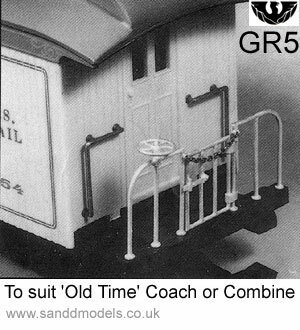 A set of 10 parts to replace both of the original plastic end balcony rails, including left and right railings, brake wheel and in addition a gate and safety chain (plated brass). Posts fit into existing holes (clean out with a 2.5mm drill).